Autumn is definitely in the air where I am. The evenings are getting cooler and the days are growing shorter. The drop in temperature makes me want to cocoon – to curl up beside my (imaginary) fireplace with a cup of hot chocolate and a good book. I was so honored the other evening to be invited, as a guest author, to the Riviera Readers book club in Nice. They chose my Curious Histories of Nice, France as their book of the month and asked me to come and speak to them. Even though I’m not much of a public speaker, everyone was so nice and participated with lots of good questions. It was a lovely evening and they even gave me a beautiful bouquet of flowers. Thanks Riviera Readers! 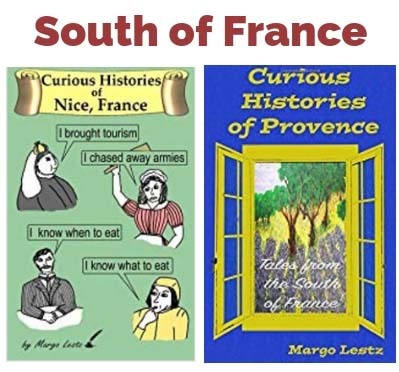 I guess this seems like the appropriate place to put in a little plug for my books… Christmas will be here before you know it, and if someone on your gift list loves France, maybe one of these books would make the perfect present. 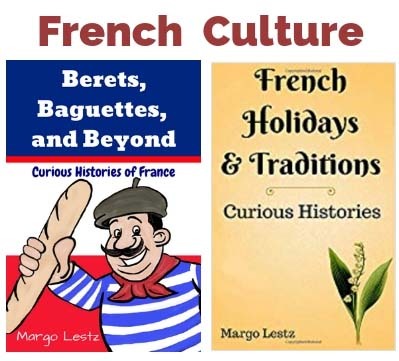 French Holidays & Traditions – Discover the, often humorous, stories about the origins of many French traditions. 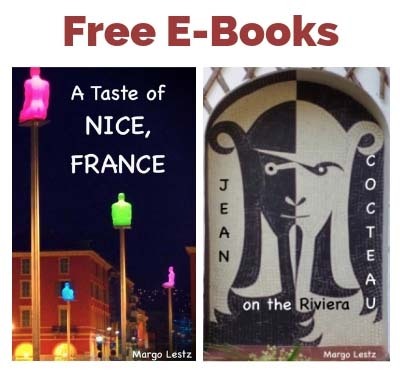 Curious Histories of Nice, France – Learn about the quirky people and events in the history of Nice. This haunted holiday has only recently gained popularity in France. If you would like to see what ghoulish things the French are getting up to in Paris this year, see this great article on Girl Gone Gallic. Want to talk about Halloween in French? Learn some useful vocabulary at the bottom of this article on French Today. Ever wonder about cheese-cutting etiquette in France? Maybe you didn’t even know there was one – but there certainly is. In this article from 24/7 in France, you’ll get all your questions answered. There was an Irish man named Jack. He was a stingy sort, and felt no need to share what he had with anyone. One night when he was going home, past the bogs, he heard a groaning in the darkness. He was shaking in his boots because he thought it was a wandering spirit. Then the voice reassured him that it was just a lost traveler – sick, cold and nearly dead. Jack was so relieved that he forgot himself, picked up the poor old man, and took him home. He fed the stranger and put him to bed. Then in the wee hours of the morning, Jack was awakened by a bright light that filled his entire house. He jumped out of bed and found himself face to face with a young man dressed in a white and sporting white feathered wings. Jack thought for a moment, then made his first wish. “I have a beautiful sycamore tree in front of my house, but everyone who passes by wants to break off a branch. I wish that the hand of anyone who touches the tree with that intention would stick to the tree until I would release him. Secondly, I wish that anyone who sits in my favorite chair would not be able to get up and the chair could not be moved until I would give them permission. Thirdly, I have a box on the wall where I keep the tools I use to mend my shoes. Every time I turn by back, someone is using them. My third wish is that anyone who puts his hand into that box will not be able to remove it and the box will not come loose from the wall, until I say so. And those are my 3 wishes.” Jack was quite satisfied that he had used his wishes so wisely to catch those who tried to take what belonged to him. The angel shook his head sadly and granted Jack’s requests. Then he informed Jack that he would be excluded from heaven because he had not learned his lesson of compassion. However, the angel’s blessing on his home stood and Jack’s crops and livestock prospered. “Ungenerous Jack” became a rich man. The demon sat in Jack’s chair and when he tried to get up he couldn’t. Jack started beating him with a heavy wooden stick and wouldn’t stop until the demon promised never to return. Well, the second demon had already heard about the chair so he declined. Jack calmly sat in the chair and took off his shoe. “Would you mind handing me my tools from that box on the wall?” he asked the demon. Demon number 2 complied and then couldn’t remove his hand from the box. Jack again brought out his stick and beat the demon until he too, promised never to return. Down in the underworld, the Devil had heard these stories about Jack and decided to go himself to Jack’s house. But knowing Jack’s reputation, he wouldn’t enter the house. He demanded that Jack come out and go with him. Satan, not wanting to carry the old man, went over to break a branch off Jack’s tree. Of course, he was stuck there and Jack started beating him as he had beaten the demons before him. Finally the Devil could take no more and promised never to come back for Jack and to never permit Jack’s descent into hell. Well, Jack eventually died, as all men do. But his soul was unfit for heaven and he was banned from hell. He was forced to wander the bogs of Ireland with a lantern that he carved from a turnip. And the eerie light seen over the bogs was supposed to be Jack with his flickering lantern – Jack with the lantern – or jack-o’-lantern. In Ireland the jack-o’-lanterns were carved from turnips or other vegetables. Some think the Irish immigrants took the jack-o’-lantern tradition to the United States where turnips gave way to the now-popular pumpkins. *Don’t Miss Anything – If you would like to receive an email every time I post an article (2-3 times per month), sign up to follow my blog. You’ll find the button just above my photo. And, of course, you can always leave a comment below. Thank you for reading! Happy Halloween! Recently read article where they claim that Samain/Halloween is really Breton. Hmm. Trying to explain to French we carved turnips in Ireland before the pumpkin became more readily available has been getting me even more strange faces, and queries as to my sanity again. No wonder i got arthritis at an early age! Great articles again. An early bon weekend from Chez le Ch’tis Margot. Glad the books getting more publicity. Link to the article and video. https://jack35.wordpress.com/2015/10/29/lorigine-dhalloween-video/ I know the French celebrate if that is the word, on 1 November by visiting the cemetaries and cleaning the graves of families and loved ones. My fiancée’s parents are up visiting from the Ch’sud do do just that. Have heard further back in past they would actually take picnics to the gravesides and have conversations as if the deceased were still with them. How much is truth, how much urban legend, and how much is to wind up a seemingly uninformed Irishman i’m not sure! Halloween is definitely growing in popularity in south west France, in our village all of the local children are carving pumpkins, choosing their costumes and planning on trick or treating, of course this is all much to the delight of our own children!!! Wonderful story and wonderful lesson!